All of a sudden you have a humming air compressor. What’s with that? If your air compressor hums instead of the motor firing up, it’s telling you something. The message the the humming air compressor is trying to tell you is that it is quite likely a power related issue that is the problem. Here are some steps for you to try and resolve a humming air compressor motor issue, from the least complex through to the more complex diagnosis and fix. If you have had to move your air compressor to use it and as a result you needed to get power to it via an extension cord, the extension cord is quite possibly the problem. If you are using a 14 gauge x 100′ extension cord, for example, you are almost certain to be starving your compressor motor, and it cannot get enough juice to get going. It may start to hum. Extension cords are not recommended for many air compressors. The first thing to do if the compressor starts to hum is to plug it directly into a wall socket. If the compressor starts without humming, your extension cord is not heavy enough gauge or is too long. Lose it. Your compressor prefers a power supply with a 20 AMP breaker, and has no other electrical appliances pulling power from the same circuit. If where you need compressed air requires you to move the compressor and use an extension, I recommend that you instead use as air hose to extend the reach. The longer hose will diminish the flow of air to the air tool that is true, and a high demand air tool might struggle a bit, but using an extension cord will possibly damage your compressor motor. Better under-supply the air to the tool (since that will not hurt the air tool) than to under-supply the electricity to the compressor motor and destroy it in the process. Did this resolve the problem with the humming air compressor? If not, please read on. Does The Compressor Unloader Valve Work? When an electric air compressor motor cannot start against a too-great load, the motor may make a humming sound. If you unloader valve does not work, then the added load of air trapped over the piston may be enough to prevent the motor from starting, the motor continues to struggle to start, and begins to hum. 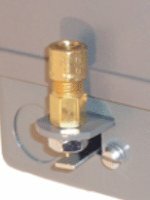 See the pages on this website about what the unloader valve is and what it does if you are not sure, and then check the unloader valve on your compressor to be sure it works. A quick check for unloader valve malfunction is to completely empty the air tank before trying to start the compressor. If after draining the tank to zero PSI the compressor motor starts and doesn’t hum, you likely need to get the compressor unloader valve fixed. Air compressor still humming when it’s trying to start? Although it’s not a frequent occurrence, a partially or fully blocked tank check valve can back pressure the pump and add load to the motor, creating that humming sound. Since I am providing tips on this page that range from the least intrusive and simplest through to more complex compressor checks, even though cleaning the tank check valve does require some work, it’s an easier check than those that follow. Unplug the air compressor, open the tank drain and the PRV valve, and drain the tank completely. Remove the line from the pump head where it reaches the tank, and typically you will find the tank check valve there. It’s a one way valve. Blow through it both ways. Air should flow easily in one direction, and not at all in the other. Wipe your lips! If the check valve isn’t working properly, quite often it only needs a good cleaning. Rinse in a clean solvent a few times, let it dry thoroughly, and reassemble. If cleaning the tank check valve does not improve its operation, replace it. Depending on how the compressor motor is connected to the pump, if you can remove a built or de-couple the motor, try turning the pump by hand. If there is a pulley, that makes it pretty simple. If the motor is directly connected, that makes it more difficult, for sure. What we are trying to accomplish is to see if the pump itself has a mechanical issue that is binding it up, backloading the motor, and creating the humming sound. If the compressor pump cycles relatively easily by hand, odds are good that the pump is OK. Time to check the next item on the list. Is It A Capacitor Problem? Assuming that your power supply is good, and you are not using an extension cord, your tank check valve is clear, and the pump cycles relatively easily, then your humming air compressor motor problem can be caused by a dead or dying compressor motor start capacitor. See the troubleshooting page and follow the links to pages about checking the caps and how to test capacitors and do so for the caps on your compressor, assuming the motor has them. If your start or start/run capacitor is causing the problem, you will need to replace the start cap. See the help page about finding a replacement capacitor on this site too! If the start capacitor tests as OK, then that’s pointing to the motor itself as being the cause of the humming sound. A winding issue, a centrifugal switch… something has failed in the motor. Testing an electric motor means removing it from the compressor and taking it to a shop. In my opinion it’s not enough for them just to add power and watch the motor spool up, there needs to be load on the motor shaft to replicate the environment on the compressor. Make sure they do that. That’s why testing the motor is the last thing on the list of diagnosing and fixing a humming air compressor. It’s complex and time consuming, not to mention quite possibly expensive. Good luck with yours.